Wit beyond measure is man’s greatest treasure. JK Rowling changed the world when she wrote the Harry Potter series. Not only did she write seven amazing novels, but she created a new and exciting world for her readers to lose themselves in. If you don’t already know the story of Harry Potter, there’s too much to summarize here, so we recommend picking up the books already (you’ll thank us!) or checking out the HP Wikipedia Page for a detailed summary. Suffice to say the books revolve around Harry, an orphan boy who, on his 11th birthday, finds out he is a famous wizard, and is invited to attend Hogwarts School of Witchcraft and Wizardry. Hogwarts is separated into four houses, each named after one of the founders of the school: Hufflepuff, Slytherin, Ravenclaw, and Gryffindor. Once students arrive at Hogwarts for their first year, the magical Sorting Hat is placed upon their head to choose which house they belong in according to their personality. Founder – Rowena Ravenclaw, an intimidatingly beautiful witch who was known for being intelligent and creative. She was skilled in architecture (she designed the moving staircases inside of Hogwarts) and she also created an enchanted diadem inscribed with the words “Wit beyond measure is man’s greatest treasure.” Wearing the diadem increased the wisdom of whoever wore it. The diadem became her relic. Animal Mascot – Eagle. Although it looks like a raven in the movies, it is definitely an eagle. Common Room – After climbing up a tight spiral staircase in one of Hogwarts’ towers, you get to the Ravenclaw Common Room. It is an airy, circular room with midnight blue carpet and a ceiling painted with stars to look like the night sky. It is furnished with tables, chairs and bookcases. The walls are hung with blue and bronze silk and there is a white marble statue of Rowena Ravenclaw. Harry and Luna go into the Ravenclaw Common Room in the 7th book. 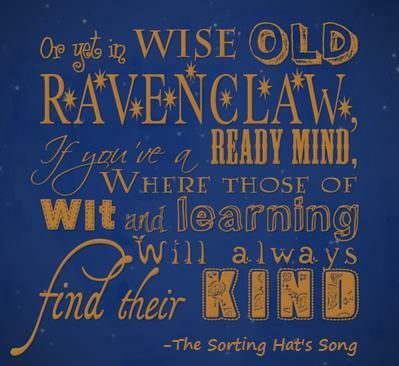 Do you have what it takes to be a Ravenclaw? Rowena Ravenclaw, one of the most intelligent witches of her time, had a set of values that was important to her when choosing students for her house. According to her, Ravenclaw students must possess intelligence, wisdom, cleverness, wit and creativity. Because of the traits admired by Rowena Ravenclaw, instead of having a password to get into the Ravenclaw Common Room, students are asked a riddle by a bronze eagle door knocker. If the student gets the question right, they are allowed to enter, but if they get it wrong, they have to wait around until someone else comes and gives the correct answer. Helena Ravenclaw/ The Grey Lady – The ghost, The Grey Lady, was Rowena Ravenclaw’s daughter, Helena. She plays an important part in the 7th book. Moaning Myrtle – The ghost of the 2nd floor girls’ bathroom, the only person ever killed by Salazar Slytherin’s basilisk in the chamber of secrets. 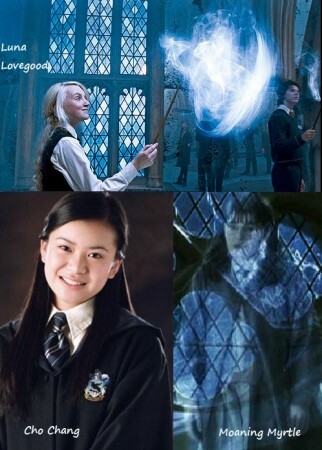 Cho Chang – Harry Potter’s love interest in then 5th book. Luna Lovegood – The quirky and lovable girl who becomes really good friends with Harry, Ron, Hermione and Neville. Anthony Goldstein, Michael Corner, Padma Patil, and Terry Boot – Members of Dumbledore’s Army. As a Ravenclaw girl, you most likely spend lots of time curling up to read a book, doing something artsy, or studying even though you probably don’t need to. This is a perfect outfit for class or after school studying in a coffee shop. It is a comfortable yet stylish chambray shirtdress, argyle tights and a large bronze tote bag to hold all of your books and notebooks. I also included an eagle cameo necklace, since the eagle is Ravenclaw’s mascot. This outfit can work for pretty much anything. You can wear it to lunch, for a shopping trip, or even for a casual date. It’s not your typical everyday outfit, but, then again, creative Ravenclaws are anything but typical. 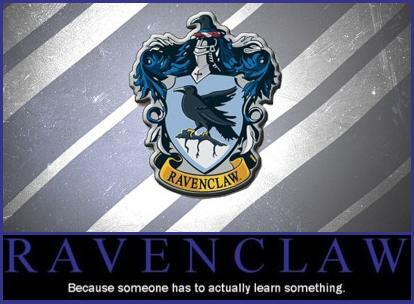 ​Not only does it portray Ravenclaw’s colors, but it also includes a (glow-in-the-dark!) dress covered in stars to look like the night sky, just like the ceiling in the Ravenclaw Common Room. I also included a cute watch with the letter “R” to show House pride, and bronze owl earrings, since Ravenclaws are known for being wise. For a dressy evening event, a Ravenclaw girl would want to look elegant, yet interesting. This dress is just that. It is beautiful, but it has just the right amount of quirkiness to gain Luna Lovegood’s approval. Since Rowena Ravenclaw’s relic is a magical diadem, I used a jeweled headband to add just enough sparkle. 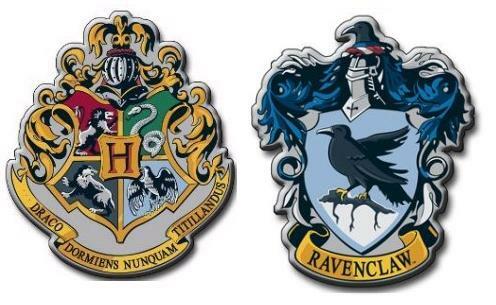 Are you inspired by Ravenclaw and the other Hogwarts houses? Which house do you think you would belong to if you lived in Harry Potter’s world? Which Hogwarts House-inspired article are you excited to read in the future? We want to know what you think, so be sure to leave a comment! Editor’s note: This post was originally published in 2011; it was completely updated and revamped in 2018 by Sharon with new photos, outfit sets, and information.